The world’s population grew to seven billion in 2011. “Although population growth has slowed for the world as a whole, this report reminds us that some developing countries, especially in Africa, are still growing rapidly,” said the Under-Secretary-General for Economic and Social Affairs, Wu Hongbo in a press release on the report. The report, World Population Prospects: the 2012 Revision, notes that the population of developed regions will remain largely unchanged at around 1.3 billion from now until 2050. In contrast, the 49 least developed countries are projected to double in size from around 900 million people in 2013 to 1.8 billion in 2050. Compared to previous assessments of world population trends, the new projected total population is higher, mainly due to new information obtained on fertility levels of certain countries. For example, in 15 high-fertility countries of sub-Saharan Africa, the estimated average number of children per woman has been adjusted upwards by more than 5 per cent. “In some cases, the actual level of fertility appears to have risen in recent years; in other cases, the previous estimate was too low,” said the Director of the Population Division in the UN’s Department of Economic and Social Affairs, John Wilmoth, during a press conference in New York. Mr. Wilmoth added that changes in fertility rates over the next few decades could have major consequence for population size, structure and distribution in the long run. The report notes that India is expected to become the world’s largest country, passing China around 2028, when both countries will have populations of 1.45 billion. After that, India’s population will continue to grow and China’s is expected to start decreasing. Meanwhile, Nigeria’s population is expected to surpass that of the United States before 2050. Europe’s population is projected to decline by 14 per cent, the report states, and Mr. Wilmoth warned that the continent is already facing challenges in providing care and support for a rapidly aging population. Overall, life expectancy is projected to increase in developed and developing countries in future years. At the global level, it is projected to reach 76 years in the period 2045-2050 and 82 years in 2095-2100. By the end of the century, people in developed countries could live on average around 89 years, compared to about 81 years in developing regions. The report’s figures are based on a comprehensive review of available demographic data from 233 countries and areas around the world, including the 2010 round of population censuses. 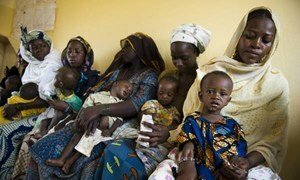 Investing in the sexual and reproductive health of women and girls will help accelerate the achievement of the Millennium Development Goals (MDGs) and the post-2015 sustainable development agenda, United Nations senior officials said on the final day of the Women Deliver Conference.